Corpiness is an impressive Alarm System business listing B2B website. Here we offer confirmed suppliers and manufacturers from Alarm System business. We are giving our level best to give you good suppliers and dealer distributors to advertise your business. We always tries to find work at home possibilities for their promoters. Here, you can look for an Alarm System by its name or by business name and get fast results to send Business Enquiry. The Alarm System right here are classified consistently to accomplish fast look for. Routing through the groups and subtypes of Alarm System is sleek. Here, you get access to recent Buy leads and Sell leads for Alarm System. Conventional fire alarm system provides the earliest practicable fire detection and warning. 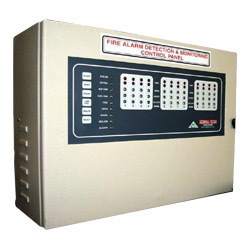 This Conventional fire alarm system consists of smoke, beam or heat detectors at designated locations, to detect smoke or heat at the earliest during any outbreak of fire.